At Cook For Your Life, it’s our mission to give those touched by cancer the practical knowledge, tools and inspiration to cook their way through treatment and into a healthy survivorship. 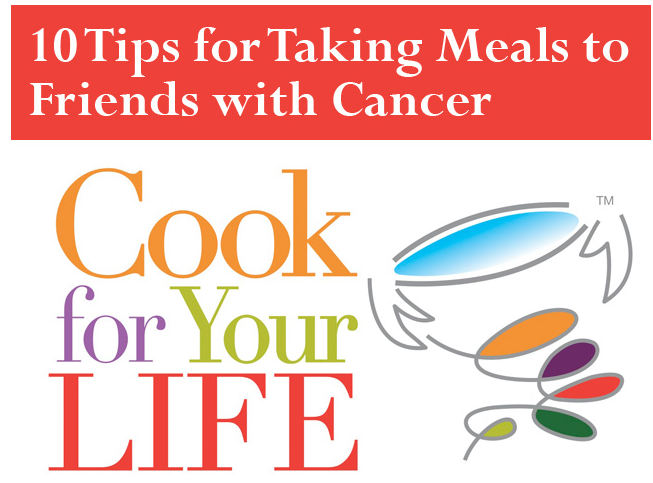 Take Them a Meal provides a wonderful platform for caregivers and family members to help out loved ones with cancer by bringing them food during a time when good nutrition is extremely important. But, there are a lot of important factors to keep in mind when bringing meals to a loved one with cancer. First, it’s important to maintain an open dialogue about food with your loved one and their main caretaker so you can ensure you are truly giving them the help they need. Also, be aware that chemotherapy and radiation can cause changes in taste, appetite, and can cause a depleted immune system so talk to your loved one about these issues before bringing them a meal. You can narrow down recipes to bring them by using the treatment based recipe search on our site, which will pare down recipes based on the treatment they’re in, side-effects they may have, or their dietary restrictions. It’s usually a first reaction to bring sick friends or family members comfort food. That’s OK. Just make sure you are cooking them in a healthy way, and including important nutrients. For instance, you can bring them meatloaf, just make it with chicken or turkey and include plenty of vegetables. You can find our recipe here. There are plenty of ways to cook classic comfort foods in very nutritious ways. If a friend is feeling nauseous from treatment, it can be good to bring them bland-tasting food like Leek & Rice Soup, Potato Rosemary Risotto, or even Poached Chicken. And avoid bringing foods with a strong odor, as a memory of the smell could turn them off of those foods for good, even when they’re well into survivorship. You don’t have to bring huge meals. Registered Dieticians and Oncologists often recommend that patients keep small, ready-made meals around the house. Look into bringing veggie based side dishes and snacks that are easy to put together. Consider making recipes that you can then freeze into individual size portions that can easily be heated up – a great alternative for a cancer patient instead of pre-made frozen meals. If someone has surgery near their intestinal area, or is dealing with digestion problems in general, cook them foods that are easy to digest also known as the ‘bland diet’ these are foods like white rice, potatoes, and cooked vegetables. Follow this link for bland diet recipes. It’s okay for cancer patients to eat sweets in moderation. But you can also add in important nutrients into sweet treats, like in our Almond Avocado Pudding, Chocolate Beet Cupcakes, or Zucchini Bread. Next Next post: Bringing Good Vibes to Those In The Cancer Community!